Voltage ratings are often specified for many electronic components, including capacitors, resistors and integrated circuits, but traditionally this has been rare for inductors. Recent trends, particularly the introduction of higher voltage rated semiconductor devices, have created a new emphasis on operating voltage as part of the inductor selection process. Inductors once considered optimized for high current, low voltage applications are finding homes in new designs that apply higher voltage stress to the inductor. 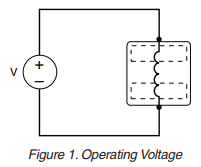 The SEPIC (Single-Ended Primary Inductance Converter) topology is used in applications that require characteristics of both a buck and a boost regulator, specifically the ability to step up and step down the input voltage. Most often operated in CCM (Continuous Conduction Mode), SEPIC provides a non-inverted output voltage. Typically, SEPIC is used in battery operated systems and automotive applications. In these applications, the battery input voltage, or bus line voltage, may be greater or less than that of the desired output voltage, depending on the charge state of the battery. The SEPIC topology can operate over more of the battery discharge cycle because of the ability to regulate the output voltage over a wider input voltage range, including above and below the output voltage. The selection of one coupled inductor over two single parts saves board space and can also save cost. 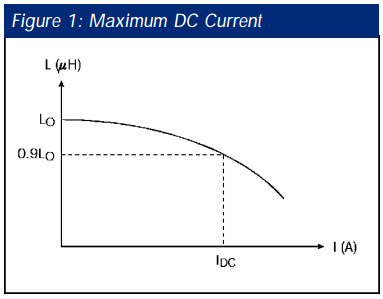 In high frequency DC-DC converters, inductors filter out the AC ripple current superimposed on the DC output. Whether the converter steps the voltage down – buck – or steps the voltage up – boost – or both up and down – SEPIC, the inductor smooths the ripple to provide a pseudo-DC output. For battery powered applications, battery life is extended by improving the efficiency of the entire power supply circuit, and inductor efficiency is often a major consideration in the design. Careful consideration of inductor efficiency can mean the difference between having your battery work when you need it and having to stop in the middle of an important task to plug it into a charger. Inductor efficiency is highest when the combination of core and winding losses are the lowest. Therefore, the goal of highest efficiency is met by selecting an inductor that provides sufficient inductance to smooth out the ripple current while simultaneously minimizing losses. The inductor must pass the current without saturating the core or over-heating the winding. The accurate measurement of an inductor has always been more difficult than the measurement of other passive components. The primary difficulty with coil measurements lies in the fact that coil inductance and its efficiency are quite frequency dependent; similarly, coil parasitics (distributed capacitance and core/copper resistive losses) vary dramatically with frequency. The measurement of a coil at the application frequency, so-called “use frequency testing,” is more representative of the basic value of the component in circuit than testing at traditional standard frequencies. 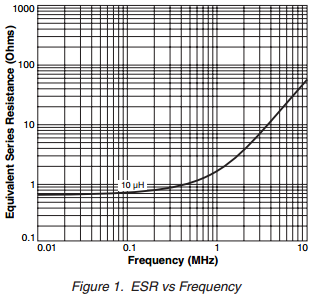 Often, the value of a measurement frequency is specified for measurement convenience alone. 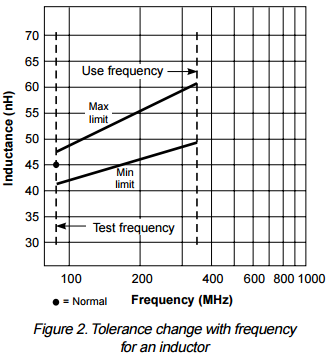 If the measurement frequency is not the circuit (or “use”) frequency, the result of testing generally will not yield the same inductance value or display the same efficiency as seen by the intended circuit. Given that recent developments of equipment and methods now allow more flexibility in test frequency selection, inductors should be tested at the actual frequency of use, particularly if tight tolerances are required. Voltage ratings are often specified for many electronic components, including capacitors, resistors and integrated circuits, but rarely for inductors. This article addresses the reasons why working voltage ratings are not typically published for inductors. There are challenges to determine voltage ratings for inductors, either by testing or calculation. Inductors do not support dc or low frequency working voltages unless the inductance is high (typically >1 mH). Testing to verify working voltage can be difficult and should be application dependent. The various ways inductors are made, and the stresses of processes like wire bending, make calculating a theoretical voltage rating infeasible. This article presents these issues to make it easier to choose an inductor most appropriate for the specific application. 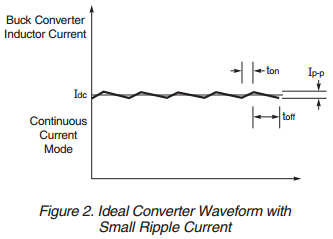 ESR vs frequency curves can be used to predict inductor losses in higher frequency converters, but careful consideration must be given to the wave shape (ripple current) of each application. Reading a specification for an inductor is considered a simple task, however, there is often some confusion even over the meaning of relatively straight forward parameters.